Cnidocytes, the eponymous cell type of the Cnidaria, facilitate both sensory and secretory functions and are among the most complex animal cell types known. In addition to their structural complexity, cnidocytes display complex sensory attributes, integrating both chemical and mechanical cues from the environment into their discharge behavior. Despite more than a century of work aimed at understanding the sensory biology of cnidocytes, the specific sensory receptor genes that regulate their function remain unknown. Here we report that light also regulates cnidocyte function. We show that non-cnidocyte neurons located in battery complexes of the freshwater polyp Hydra magnipapillata specifically express opsin, cyclic nucleotide gated (CNG) ion channel and arrestin, which are all known components of bilaterian phototransduction cascades. We infer from behavioral trials that different light intensities elicit significant effects on cnidocyte discharge propensity. Harpoon-like stenotele cnidocytes show a pronounced diminution of discharge behavior under bright light conditions as compared to dim light. Further, we show that suppression of firing by bright light is ablated by cis-diltiazem, a specific inhibitor of CNG ion channels. Our results implicate an ancient opsin-mediated phototransduction pathway and a previously unknown layer of sensory complexity in the control of cnidocyte discharge. These findings also suggest a molecular mechanism for the regulation of other cnidarian behaviors that involve both photosensitivity and cnidocyte function, including diurnal feeding repertoires and/or substrate-based locomotion. More broadly, our findings highlight one novel, non-visual function for opsin-mediated phototransduction in a cnidarian, the origins of which might have preceded the evolution of cnidarian eyes. cyclic nucleotide gated ion channel. Animal sensory systems provide a useful model for understanding the origins and evolution of complex traits. Of particular interest are questions regarding (1) the ancestral composition of sensory signaling pathways, and (2) the ancestral function of such pathways. While a detailed understanding of the signaling pathways and cell types that function in the diversity of animal sensory systems is becoming increasingly common, most work in sensory molecular biology has been confined to an exceedingly small taxonomic sample of model bilaterian species. In order to gain insights into the evolutionary origins and ancestral functions of bilaterian sensory systems we must focus our attention on taxa such as the Cnidaria that represent an evolutionary sister group to bilaterians. Perhaps the best understood animal sensory modality is photosensitivity. All known examples of visual perception in animals are accomplished, at the physiological level, by an opsin-mediated phototransduction cascade . Animal phototransduction is a canonical G protein coupled receptor (GPCR) signaling pathway that results universally in a shift in the electro-chemical potential of photoreceptor neurons by the opening or closing of an ion channel [2, 3]. Recent analyses of animal opsin phylogeny place the origin of animal phototransduction at the last common ancestor of the Cnidaria and Bilateria [4–6]. Numerous opsins are present in the two cnidarian genomes sequenced to date, Hydra magnipapillata and Nematostella vectensis, but paradoxically both of these taxa lack eyes or ocelli and are known to possess only dispersed, dermal photosensitivity [7–9]. The cnidarian phototransduction cascade is similar to the vertebrate 'ciliary' mode of phototransduction in that it utilizes a cyclic nucleotide gated (CNG) ion channel and other components of the vertebrate visual cycle [10–12]. Arrestins, which act to quench phototransduction by binding activated opsin  are another common feature of bilaterian phototransduction pathways [14–16], but their involvement in cnidarian phototransduction systems has yet to be examined. How is opsin-mediated phototransduction utilized in these eyeless cnidarian taxa? Cnidocytes and other cnidarian sensory neurons may provide some clues to this question. Cnidocytes are found only in the Cnidaria and are among the most complex cell types known in animals [17, 18]. When properly stimulated, cnidocytes eject elaborate, energetically expensive, single-use, secretion products called cnidae that function in a range of organismal phenotypes including defense, prey capture, structure, and locomotion [18, 19]. In hydrozoans, both cnidocytes and sensory neurons are found in specialized cellular consortiums called battery complexes  (Figure 1A). Such battery complexes consist of sets of functionally integrated cnidocytes that share common synaptic connections with both closely apposed sensory neurons and ganglion cells  (Figure 1A). Current evidence suggests that the cellular architecture of the hydrozoan battery complex functions to integrate sensory cues from the environment into the precise regulation of cnidocyte discharge [22–25]. Cnidocyte morphology and arrangement in H. magnipapillata. (A) A generalized schematic of the hydrozoan battery complex in cross-section. Stenotele cnidocytes (S) are flanked by isorhiza (I) and desmoneme (D) cnidocytes, as well as sensory cells (SC), which form synaptic connections with ganglion cells (G) that link each of the other cnidocyte cell types. (B-D) Confocal z-stacks of H. magnipapillata tentacle midsection (B) and tentacle bulbs (C and D). Neurons, including cnidocytes, are stained red (anti acetylated α-Tubulin) and nuclei are stained blue (DAPI). Musculature is shown in green (phalloidin) in (C and D). Axonal projections (arrow heads) link battery complexes that occur with regular periodicity along the length of the tentacle. Arrows indicate stenotele cnidocytes. (D) is an inset of (C). (A) Redrawn with permission from Westfall . While the genes that underlie the unique morphological and functional features of cnidocytes have been the focus of much enquiry [26–28], less attention has been aimed at the genetic bases for the complex sensory repertoires that regulate their function. Both chemical and mechanical sensory modalities have been shown to contribute to the regulation of cnidocyte discharge [24, 29], but to date no sensory receptor gene has been linked to any of these behaviors in Cnidaria. In addition to chemosensory and mechanosensory behaviors, cnidarians are known to display a range of photobehaviors that include diurnal migration , phototaxis , and contraction responses to light [7, 32]. Because these behaviors are often associated with feeding or defense, two activities that involve cnidocytes, we hypothesized that light information from the environment might also play a role in regulating cnidocyte function. Here we show that photosensitivity acts to modulate cnidocyte discharge in the hydra H. magnipapillata and that this property is driven by an opsin-mediated phototransduction cascade. We report that opsin and other phototransduction components are expressed in cells that accompany harpoon-like stenotele cnidocytes in battery complexes. We further demonstrate that the propensity for cnidocyte discharge can be altered experimentally as a function of light intensity. 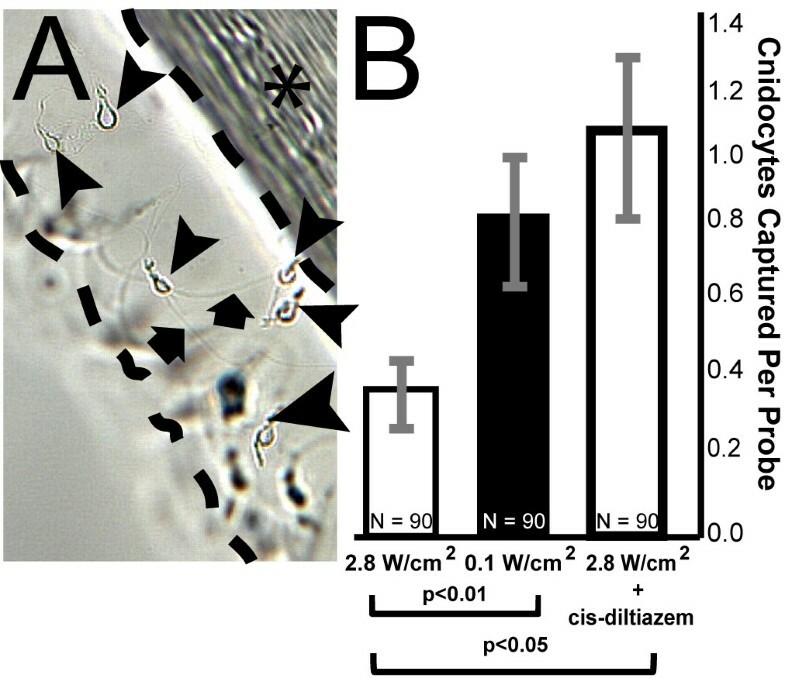 Finally, the alteration of cnidocyte discharge that we observe is reversed in the presence of cis-diltiazem, a drug known to inhibit CNG ion channels in both vertebrate  and cnidarian systems . Taken together, our results implicate a role for opsin-based phototransduction in the regulation of cnidocyte discharge in the eyeless cnidarian H. magnipapillata. In order to establish a morphological framework for comparing gene expression in the battery complexes of our study system H. magnipapillata, we explored the cellular composition of these structures using immunohistochemistry and confocal microscopy. Current knowledge of the cellular morphology of cnidocyte-bearing battery complexes is based largely on previous studies that were conducted using electron microscopy (EM) [21, 34, 35]. A simplified schematic of the hydrozoan battery complex derived from Westfall  is shown in Figure 1A. Our results reveal transverse rows of cnidocyte-bearing battery complexes that occur with regular periodicity along the length of the tentacle as described previously for other hydrozoans  (Figure 1B). Large stenotele cnidocytes, which function to pierce and envenom prey with harpoon-like tubules, are located at the center of these complexes and are distinguished from other cell types (for example, desmoneme and isorhizal cnidocytes, and sensory neurons) by pronounced α tubulin staining in their cnidocyst capsules  and by the presence of large, trigger-like, ciliated cnidocils  (Figure 1B-D). Stereocilia, which ensheath the cnidocil and are comprised in part by filamentous actin , are revealed in stenotele cnidocytes by phalloidin staining  (Figure 1D). Our immunohistochemical studies also show that ganglion cell axonal projections link discrete battery complexes along the proximal/distal axis of the tentacle as previously hypothesized  (Figure 1B-D). If phototransduction is involved in the regulation of cnidocyte discharge, we would expect opsin and other components of the cascade to be expressed together in some or all of the battery complex cells described above. In order to test this hypothesis we examined the expression of one hydra opsin, HmOps2, using in situ hybridization (ISH). This particular opsin was selected for study because its expression pattern has been reported previously [4, 12]. 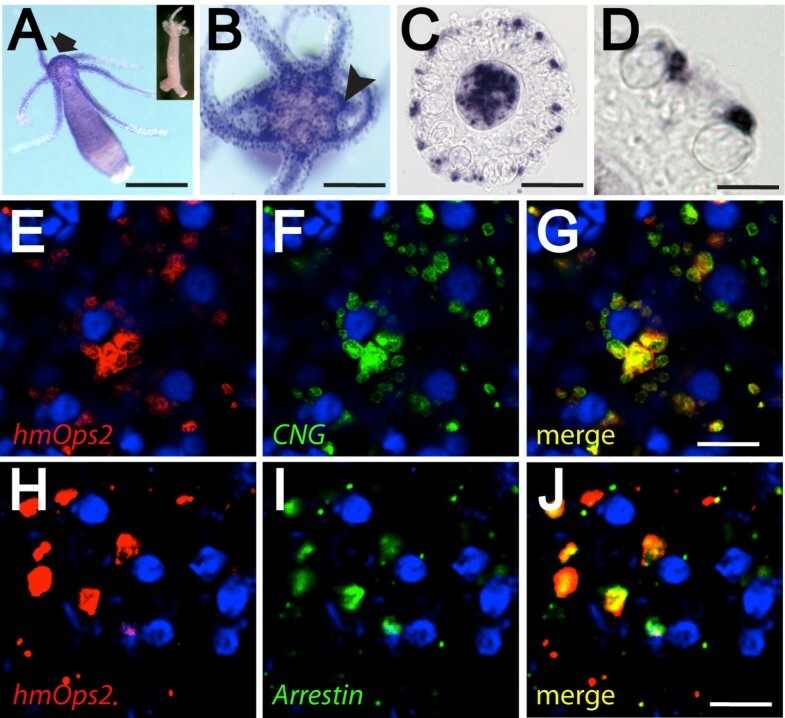 Whole mount ISH in H. magnipapillata indicated strong HmOps2 expression in the ring-like ganglion that encircles the hypostome region and distinct, punctate expression in the tentacles of the animal (Figure 2A and 2B). HmOps2 is also expressed diffusely in the body column and in the gastrodermis of the tentacles. Closer inspection, using light microscopy, of cryosections of HmOps2-labeled tentacles indicated that ectodermal opsin expression is confined to cells that lack morphological features of cnidocytes, such as the cnidocyst capsules of stenotele, desmoneme and isorhizal cell types, which are clearly visible in these preparations yet lack staining seen in other cells (Figure 2C and 2D). HmOps2-expressing-cells likely correspond to sensory-motor neurons described previously from EM studies  and immunohistochemistry [39, 40]. Studies of gene expression suggest a role for opsin-mediated photosensitivity in the regulation of cnidocyte discharge. (A-D) Colorimetric in situ hybridization with HmOps2 probe. Opsin expression is strongly localized to the hypostome (arrow), tentacles, and the ring-like ganglion (arrow head) that surrounds the mouth (A and B). (C and D) Cryosection of tentacle reveals HmOps2 expression in non-cnidocyte cell types. Cnidocytes capsules are clearly visible in these preparations. (E-I) Confocal fluorescence in situ hybridization shows that opsin transcripts co-localize with CNG (E-G) and arrestin (H, I) in battery complexes of the hydra. Blue cells with dark centers are the capsules of stenotele cnidocytes, which stain with DAPI . Signal in (E-I) and (E-G) is located at different focal planes relative to central stenotele cnidocytes. Inset of (A), sense riboprobe negative control. Scale bars in (A) = 1 mm, in (B) = 500 μm, in (C) = 100 μm, in (D) and (E-J) approximately 30 μm. To further establish the presence of opsin-based phototransduction in battery complex neurons in the tentacles of H. magnipapillata, we tested for co-expression between HmOps2 and other phototransduction components using florescent ISH (FISH) and confocal microscopy. We first assessed co-expression between HmOps2 and CNG. HmCNG is the sole CNG gene in the hydra genome and previously has been cloned and analyzed phylogenetically . Our results from confocal optical sections (0.2 μm) corroborate a highly correlated co-expression pattern between HmOps2 and HmCNG in cells that surround stenotele cnidocytes, which, based on our immunohistochemical studies and much previous work , are located at the center of battery complexes (Figure 2D-F). Next, we tested for co-expression between opsin and arrestin, a gene essential for quenching phototransduction in both vertebrate and insect visual systems [41–43]. We cloned the arrestin orthologue HmArr1 from H. magnipapillata, which is a member of a clade of non-bilaterian arrestins that is the evolutionary sister to bilaterian β arrestins. Bilaterian β arrestins include visual arrestins known from vertebrate and insect visual systems respectively (Additional file 1). Our results clearly indicate co-expression between HmOps2 and HmArr in optical sections (0.2 μm) of battery complexes (Figure 2G-I). Together, these findings suggest that a ciliary-type phototransduction cascade comprised in part by opsin, CNG, and arrestin could play a role in the sensory regulation of cnidocyte discharge. In order to test our hypothesis that opsin-based phototransduction functions to modulate cnidocyte discharge, we conducted a series of cnidocyte capture assays under different light conditions. For each assay, animals were acclimated to LED light of different intensities emitted with a very narrow wavelength spectrum peaking at 470 nm. We conducted dim light trials at 0.1 W/cm2 and bright light trials 2.8 W/cm2 (see Methods). Stenotele cnidocytes were captured with probes and counted under light microscopy as per Watson and Hessinger . Our results indicate pronounced effects of the ambient light environment on the propensity for cnidocytes to discharge. Under bright light, the magnitude of cnidocyte discharge was significantly lower than that observed under dim light conditions (Figure 3B). Behavioral studies of cnidocyte discharge indicate a significant inhibitory effect of light intensity on cnidocyte function. (A) Representative data for cnidocyte discharge assay. In this experiment stenotele cnidocytes were captured using gelatin-coated lengths of monofilament under different experimental conditions. (B) Significantly fewer cnidocysts were recovered from assays conducted in bright blue light (470 nm; 2.8 W/cm2) than in dim trials (470 nm; 0.1 W/cm2). Bright light suppression was ablated by the presence of the CNG inhibitor cis-diltiazem. Area between dashed lines in (A) = gelatin matrix; asterisk = monofilament; arrow heads = stenotele cnidocytes. Because CNG ion channels have been implicated in opsin-mediated phototransduction in cnidarians [10, 12] and because transcripts of CNG co-localize with opsin in battery complexes (Figure 2E-G), we tested the efficacy of the CNG ion channel inhibitor cis-diltiazem  to ablate the light induced effect on cnidocyte function. Cis-diltiazem (1 μM) reversed the observed reduction of cnidocyte discharge under bright light, as compared to dim light. Further, bright light trials conducted in the presence cis-diltiazem were statistically indistinguishable from control dim light trials performed without the drug (Figure 3B). From this we conclude that environmental information on light intensity acts to regulate cnidocyte discharge and that this property involves CNG function. Our results provide a window into a previously unknown aspect of cnidarian sensory biology. We demonstrate that opsin-based phototransduction acts to regulate cnidocyte discharge by integrating information from the light environment into a behavioral outcome. Numerous stereotypical photobehaviors ranging from diurnal migration , phototaxis [32, 44], and the contraction response [32, 45] have been described in cnidarians, but no previously published data have demonstrated a role for light information in the regulation of cnidocyte function. We note, however, that an earlier report of unpublished data from studies in the anthozoan Aptaisia pallida are consistent with our results . Our immunohistochemical studies of the tentacles of H. magnipapillata provide morphological landmarks for correlating the expression of opsin and its biochemical signaling partners with cells that localize to battery complexes. Battery complexes are apparent in our immunohistochemical data as rosettes of nuclei that occur with regular periodicity in transverse rows along the length of the tentacle (Figure 1B). Together with structural features of cnidocytes that are clear in light microscopy (such as the presence of cnidae), we can correlate the expression of opsin to non-stenotele cell types that form the periphery of battery complexes. CNG and arrestin also localize to these opsin-expressing cells as shown by FISH confocal microscopy (Figure 2E-J). We note that the apparent differences in expression pattern between colorimetric (Figure 2A-C) and fluorescent (Figure 2D-F) detection methods likely arise from the higher dynamic range offered by the latter. Because our colorimetric ISH data show no evidence for opsin expression in any cnidocyte cell type, we conclude that opsin-expressing cells correspond specifically to sensory-motor neurons that were previously noted from EM studies by Westfall . Interestingly, previous EM studies described the presence of pigment granules in these sensory neurons , which suggested a possible role in photoreception . These sensory neurons have been reported to form synaptic connections with different cnidocyte cell types within the battery complex, and with ganglion cells that we show here to link separate battery complexes along the proximal/distal axis of the tentacle  (Figure 1B). Thus, phototransduction in any battery complex cell type has to potential to regulate firing in adjacent complexes, as has been shown for chemoreception . The functional link that we propose between opsin-mediated phototransduction and cnidocyte discharge is supported by our behavioral studies wherein the effect of light intensity on cnidocyte firing was ablated by the drug cis-diltiazem, a specific inhibitor of CNG . Three observations support our view that cis-diltiazem efficiently perturbs CNG signaling in the context of phototransduction in H. magnipapillata. First, all individuals included in cnidocyte firing assays conducted in the presence of the drug were responsive to mechanical stimuli and appeared otherwise normal following experiments (n = 90). From this we conclude that non-photoreceptive nervous system function in the hydra is not noticeably affected by cis-diltiazem at experimental concentrations. Second, a single CNG (HmCNG) locus is present in the genome sequence of H. magnipapillata and the expression of this gene is tightly correlated with that of opsin (Figure 2D-F) , thus diminishing the possibility that our drug treatment differentially affected some other unknown, non-phototransductive CNG-based process that indirectly alters the propensity for cnidocyte discharge. Finally, we have previously shown that cis-diltiazem is effective in perturbing the contraction response , another light driven behavior in H. magnipapillata [7, 45]. These factors lead us to conclude that the effect of cis-diltiazem on cnidocyte discharge is specific to CNG and phototransduction. What might the organismal and ecological relevance of light-regulated cnidocyte discharge be? The integration of light information into cnidocyte firing behavior by opsin-based signaling could make the successful deployment of cnidocytes into prey items or aggressors more likely. Cnidocytes are energetically expensive to maintain and discharge, and they comprise a significant proportion of cells in H. magnipapillata . We propose that the accuracy of cnidocyte discharge may be enhanced by the integration of information on ambient light intensity in at least three non-exclusive ways. First, feeding behavior of many freshwater and marine organisms is tuned to diurnal cycles that peak at dusk [30, 47]. The significant negative association between cnidocyte discharge and light intensity that we report here could function to reduce the propensity of cnidocytes to discharge during daylight hours, when prey items are scarce, and to arm them at dusk, when productive feeding hours begin. Second, light information in the form of a shadow being cast locally by prey on battery complex sensory neurons could provide another layer of sensory precision, thus enhancing the likelihood that stenotele cnidocytes make contact with and envenom prey items rapidly. This possibility is feasible because the integration of sensory information from the environment into cnidocyte discharge behavior is known to occur within milliseconds . Finally, many cnidarians including H. magnipapillata demonstrate positive phototaxis [8, 49], which is accomplished by an end-over-end 'somersaulting' behavior. Locomotion of this sort requires non-feeding isorhizal cnidocytes to discharge and adhere to the substrate . One additional possibility is that opsin-mediated inhibition of stenotele and possibly desmoneme discharge, two cnidocyte types that function only in feeding  could act to suppress firing in non-locomotory cell types while phototaxis is underway. Our current data cannot discriminate between these possibilities, but provide directions for future research. We demonstrate a role for opsin-based phototransduction in the regulation of cnidocyte function. The sensory biology of cnidocyte discharge has intrigued biologists since the 18th century when mechanosensory hair- and trigger-like structures were first hypothesized to actuate cnidocyte function [44, 50]. Since that time, chemosensitivity has been added to the repertoire of cnidocyte sensory biology as studies into such cues as amino acids , glycoproteins , sugars , and prey extracts  have been demonstrated to alter cnidocyte discharge behavior across a wide phylogenetic range of cnidarians. In each case, the specific sensory receptor genes responsible for these behaviors have remained unknown. Our findings represent the first evidence for a specific sensory receptor gene (for example, opsin) in the regulation of cnidocyte discharge. Future work will seek to understand how light, chemical, and mechanical signal transduction cascades work together to coordinate cnidocyte discharge behavior. Our results may also have relevance for cnidarian eye evolution, if light modulation of cnidocytes is a general and ancient feature of the phylum. Because immunohistochemical surveys have identified similarities in cnidocyte innervation between representatives of each cnidarian class , our finding that light regulates their function in the hydra could extend to other classes as well. Unlike cnidocytes, eyes are found only in some derived cnidarian lineages and may have more recent origins within the phylum . Therefore, we hypothesize that the regulation of cnidocyte discharge by opsin-mediated phototransduction predated this pathway's function in cnidarian eyes. Future studies will investigate the role of light in modulating cnidocyte function in other, non-hydrozoan, lineages and explore the evolutionary history of cnidarian eyes using explicit statistical methods. We conducted BLAST  searches for homologs of opsin, CNG, and arrestin from the genome sequences of the non-bilaterian taxa Amphimedon queenslandica , Trichoplax adhaerens , Hydra magnipapillata , and Nematostela vectensis , together with a taxonomically broad selection of bilaterian genome sequences, using functionally characterized sequences for each gene as queries in custom bioinformatics scripts. We have previously described the phylogenetic relationships and placement of cnidarian opsin  and CNG  using these methods and a global arrestin phylogeny has been described elsewhere . The details of our methods and a phylogenetic analysis aimed specifically at the β arrestin subclass, which includes bilaterian visual arrestins, are provided in Additional files 1 and 2. For immunohistochemistry and in situ hybridization animals were starved for two days prior to staining. Animals were relaxed in 2% urethane (Sigma) in hydra medium (HM; 1.0 mM CaCl2, 1.5 mM NaHCO3, 0.1 mM MgCl2, 0.008 mM MgSO4, 0.03 mM KNO3; pH 8.0) and fixed overnight at 4°C in 4% paraformaldehyde (Sigma) in HM. For immunohistochemistry, animals were washed five times for 5 min in PBST (3.2 mM Na2HPO4, 0.5 mM KH2PO4, 1.3 mM KCl, 135 mM NaCl, 0.1% Tween 20, pH 7.4) and blocked for 2 h in PBST + 20% normal goat serum (NGS; Sigma) at room temperature. Animals were then incubated with primary antibody, anti-acetylated α tubulin (1:500; Sigma), in blocking solution overnight at 4°C. Following primary antibody, animals were washed five times for 5 min in PBST and blocked as before. Secondary antibody, Cy2-conjugated anti mouse Ig (Jackson), was added over night at 4°C in blocking reagent. Samples were then washed five times for 5 min in PBST and a solution containing 1:1000 of DAPI stock (Molecular Probes) and 1:1000 Alexa Fluor 488-labeled phalloidin stock (Invitrogen) in PBST was added for 1 h. Samples were then washed five times for 5 min and mounted in glycerol. For in situ hybridization, all loci were cloned based on publicly available EST sequences. HmOps2 corresponds to CV151648, HmCNG corresponds to DT606755 (a single-copy gene) and HmArr corresponds to CV464909. FISH confocal microscopy and RNA probe construction for HmOps2, HmCNG, and HmArr were conducted as previously reported . Hydra magnipapillata (strain 105) was cultured using standard methods in HM . Our cnidocyte capture assay was based on the method of Watson and Hessinger . Lengths of fishing line (10 cm) were dipped twice in 20% gelatin (Knox) that had been dissolved in HM and heated to 65°C. Gelatin concentration was optimized in preliminary trials. Polymerized probes were used within 1 h of fabrication. For cnidocyte capture trials, we placed healthy and responsive animals in either dim blue light (0.1 W/cm2) or bright blue light (2.8 W/cm2) for 6 h prior to probing. In each case, light came from a blue (470 nm peak) LED array (SuperBright LEDs, part # E27-B24) placed at different distances from the animals to adjust brightness. To measure light intensity, we used a Jaz ULM spectrometer (Ocean Optics, Dunedin, FL, USA). We integrated intensity measurements between 435 nm and 515 nm wavelengths, using an integration time of 0.1 s. Ten individuals were placed into a test arena and animals were probed once at the distal tips of tentacles for approximately 1 s before the probe was withdrawn. The distal 1 cm of the probes were cut and mounted in glycerol. Cnidocytes that were collected in the probes were counted by light microscopy at 40×. The same procedure was used during trials with the CNG inhibitor cis-diltiazem (1 μM in HM; Sigma). Owing to the harpoon-like structure of discharged stenotele cnidocils, discharge data on these cell types are preferentially recovered. Our experimental design first tested for differences between trials under bright and dim light, and then tested for differences between trials under bright light and bright light + cis-diltiazem. Data from 90 replicates from each experimental condition passed a D'Agostino & Pearson omnibus test of normality. Data were then compared using unpaired t-tests in Prism 5 (GraphPad). The manuscript was significantly enhanced by thoughtful comments made by Glen M Watson, the editorial advisor and two anonymous reviewers. Funding was provided by NSF DEB-0710406 to DCP and THO, and by NSF 0643840 to THO. DCP is a Howard Hughes Medical Institute postdoctoral fellow of the Life Sciences Research Foundation. DCP conceived and designed the study, carried out some of the behavioral assays, analyzed the data, and drafted the manuscript. CRF contributed to the design and implementation of the majority of behavioral assays. THO contributed to the design of the study and drafted the manuscript. All authors have read and approved the final manuscript.